Keith Pelley of the European Tour and Martin Slumbers of the R&A are set to meet in the coming days to formulate a plan to end the scourge of slow play on Tour. But maybe they should be contacting some of these guys to see how it's done. 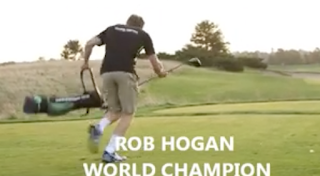 These are the fastest golfers in the world at the recent Speedgolf world championship won by Ireland's Rob Hogan. Rob says he's ready willing and able to help the boys speed up the game if asked. And here's Rob's instructional vid.